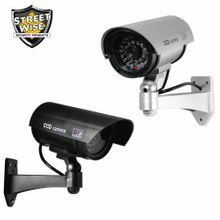 Now its easy to add a layer of protection to your home or business premises with this Fake Security Camera. Install a pair of AA batteries and the red flashing light will make it look like its actually recording the scene in front of it. This is the housing of a real security camera with the expensive inner working left out. You can't get more realistic than that. Highly Visible: Noticeable during the day and at night the flashing red LED light guarantees that it will be noticed.